Am I obligated to sell my home even if the highest price isn’t high enough when I sell my house fast? Does using the 5 Day Method create a “bidding frenzy”? Why does the 5 Day Method work to sell my home fast? What's the hardest part of using a 5 Day sale to sell my house fast? Is my home too rural to sell with the 5 Day Method? What if something goes wrong at the last minute? What is your connection to GeorgeCappony.com? Do you work for Bill Effros or independently? Does the GeorgeCappony.com website belong to you, or Bill's organization? Are there other consultants who, like yourself, are available for coaching on how to sell my home fast? Beyond the free 30-minute consultation, what are your fees for consulting? Do you typically work with us by phone & eMail, or on-site (do you travel)? Do you do anything to sell my house fast above and beyond the book? Do you recommend the use of a website to sell my home fast? George, how can we get extra value by engaging you? How do you handle the business details? How do you differ from Agents or Brokers and what is your Unique Selling Proposition? Am I obligated to sell my home even if the highest price isn't high enough when I sell my house fast? In a word, no. Details: I can outline for you a simple strategy, one which everyone who bids on your home will be able to easily understand, that will ensure that you get the price you want, while safeguarding you in the event that you aren’t ready to sell or take the highest bid for any reason. You and your property will be completely protected, and you will be fully prepared for your sale. For more details, contact me for a FREE 30 minute consultation to discuss the specifics of the 5 Day Method. Does using the 5 Day Method create a "bidding frenzy"? No. Because bidders are in their own home with only their families and they have as much time as they need to decide on their bids, bidding frenzies rarely occur when you sell your house quick with the 5 Day Method. Bids tend to be carefully considered. High bidders are almost always thrilled with their bids. The bids are usually honored. A 5 Day sale is all about time compression. The method works because both the buyer and the seller are looking for a fair deal. If there is one thing that characterizes a 5 Day sale (other than the speed of the sale), it’s the fact that both the buyer and the seller consider the deal fair. Learn more on why the method works every time to sell your house quick, and why the deals almost always go through. What’s the hardest part of using a 5 Day sale to sell my house fast? The hardest part of using a 5 Day sale to sell your house quick is being honest with yourself. Most people overvalue their homes. Then they hope they'll get more than they’re hoping for. They never consider their home may be worth less than they’re hoping for. The beauty of using the 5 Day Method is that, if run properly, it will consistently find the top end of the fair market value in exactly five days. You may not like what you learn, but the method doesn’t lie. Learn more about this amazing home-selling method. It is or it isn’t, it just depends. I’ve worked with people in the bayous of Louisiana who lived ten miles outside some town a hundred miles from any town you've ever heard of. After trying to find a buyer for more than two years, their broker told them their home was too rural. So they tried the 5 Day Method. One hundred people called. Forty people visited their home. They sold that home in five days, and got more than they were hoping for. I can tell you virtually the same story about people in Maine and Montana. If your starting price is low enough when you, you will attract all the real buyers and they will bid against each other. The 5 Day Method works to sell your house quick almost no matter where you live. If you're worried that your home might be too rural for a 5 Day Sale you can always contact me for a free 30 minute consultation to discuss if I think a 5 Day Method will work for you. When you run a 5 Day Sale you don’t have to commit yourself until one day before your sale begins. If you’re not ready, or the unexpected happens, you can easily postpone your sale until another weekend that’s better for you. Contact me for a FREE 30 minute consultation to discuss the specifics of your home sale. I, George Cappony, am the owner and web host for GeorgeCappony.com. I offer consulting services for those interested in using the 5 Day Method. I use the concepts of Bill Effros' book and accelerate them with various unique promotional techniques to market your home. You can learn more about this amazing home-selling method, or if you have specific questions about your situation and whether or not a 5 Day Sale can work for you to sell your house quick contact me for a FREE 30 minute consultation. Bill is a very close friend of mine. Years ago Bill decided he wanted to retire from 5 Day consulting. He passed the reigns to me and allowed me the privilege of operating the 5 Day.com website on his behalf. Of course, he and I still keep in touch, but I work independently from Bill Effros. 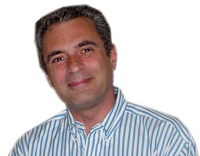 GeorgeCappony.com is my own website, and operates independently of Bill Effros. The previous website called 5 Day.com now points to GeorgeCappony.com. The new website allows us the freedom and creativity to develop and carry out new options to help you sell your house quick, while at the same time expanding the pool of information on 5 Day Sales. Learn more about this fast home-selling method, or visit our products page for valuable home-sale marketing resources. Beyond the free 30-minute consultation, what are your fees for consulting to sell my house fast? My fees are very affordable. I’ve done consulting for homes in a variety of price ranges. From one hundred thousand to multi-million dollar homes my clients have found my consulting rate nominally priced. Contact me for a FREE 30 minute consultation to discuss your home and the services I can offer to help you sell your house quick, and get your sale right. I consult my clients primarily by phone and eMail, but I also do on-site consulting, depending on your needs. Contact me for a FREE 30 minute consultation to gain a better understanding of which consulting package will work best for you and your home sale. Yes! GeorgeCappony.com uses a team of graphic artists and designers to produce and modify 'site specific' websites, signs and a number of other valuable marketing tactics, which will entice potential buyers and create a buzz around your home in the weeks leading up to your 5 Day Sale. The most important thing you need to know about real estate, and how sell your house quick for that matter, is not about real estate, it’s about marketing. We help you market your home so you’ll have many more prospective buyers. Learn more about our exclusive marketing options for your sale. Absolutely! The book was written a decade ago when using the Internet was an ineffective way to market your home; only a few of us had access to the Internet, but now nearly every one has access. According to a recent survey by the National Association of Realtors®, 71% of home buyers used the Internet as part of their home search in the first quarter of 2003, compared to 49% of home buyers who used the newspaper. In 1995, only 2% of home buyers used the Internet, while 51% used the newspaper. This survey makes it clear that the Internet can be an effective home selling tool. A website can provide your home with valuable exposure to a modern audience. See how effective a website can be for your sale. In addition to that, the 'site specific' work we do for 5 Day Sales will also help to compel prospective buyers to visit your home. Anyone looking at a website for 5 Day Sale will gain a great deal of information on your home and the 5 Day Method very quickly, which cuts down on the time you’ll need to explain the process to them. Ask us to eMail you examples of websites we have created for our clients when you contact me for your FREE 30 minute consultation. Well, I'm the most experienced marketing consultant engaged in coaching home owners using the 5 Day home sale system on a weekly basis from coast to coast. I have a pulse of what's going on all over the country on a daily basis as I speak to so many people during the course of a week allowing me to be in touch with today's market place. I have proven myself over and over as an entrepreneur. This is at both at a personal level in my own companies as well as with clients. You can get extra value by capitalizing on my track record of success when you contact me for a consultation. Plus, you will avoid many costly mistakes, most of which I've already made. We will first have a thorough telephone consultation to discover the problems you are facing and see if this program and my services are really for you or if you are right for this program. By that I mean, are you living in reality or are your expectations full of grandeur? I meet a lot of "dreamers" that think you can make a $100.00 bill into $125.00. I don't mean to come across as brash but my time is valuable to not only myself but to the many people I can help that really do understand what market value means and are willing to learn how to help themselves. My program focuses on helping you with the three most critical aspects of helping you sell your own home: marketing, marketing, marketing. I need to know you have a certain "panache" or "chutzpa" to realistically undertake what is required to have a successful sale. If we both are in favor of proceeding, I'll then furnish my standard agreement "Letter Of Understanding" for your review and finalization. At that point I will release my proprietary systems which are not in the book and have a "kickoff" to get you started to selling your home on the day you select. Simply put: "I can show you how YOU can sell your home anywhere in the country without meeting you in person...or seeing your home…and best of all YOU get to pick the date." Now that's a mouth full. What agent can say that ?